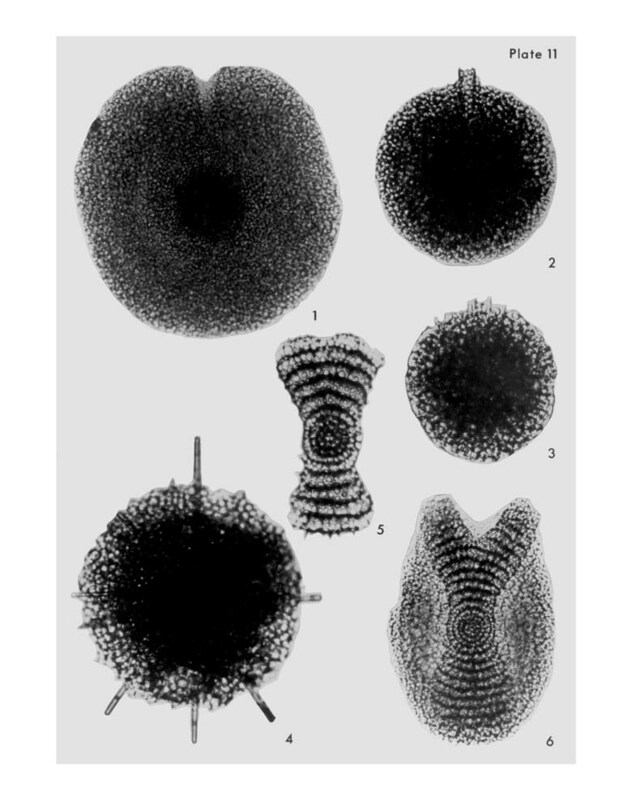 1 Spongodiscus biconcavus (Haeckel) Popofsky; VS-R-64a, 1-3cm, O40/2, 210x. 2-3 Spongopyle osculosa Dreyer; 2, VS-R-92b, 1-3cm, G21/0, 300x; 3, VS-R-27b, 1-3cm, P44/0, 300x. 4 Spongotrochus cf. glacialis, Popofsky; VS-R-81a, 1-3cm, Q41/4, 300x. 5-6 Amphicraspedum wyvilleanum Haeckel; 5, VS-R-71a, 1-3cm, W23/0, 300x; 6, VS-R-60a, 3-5cm, V22/2, 220x.